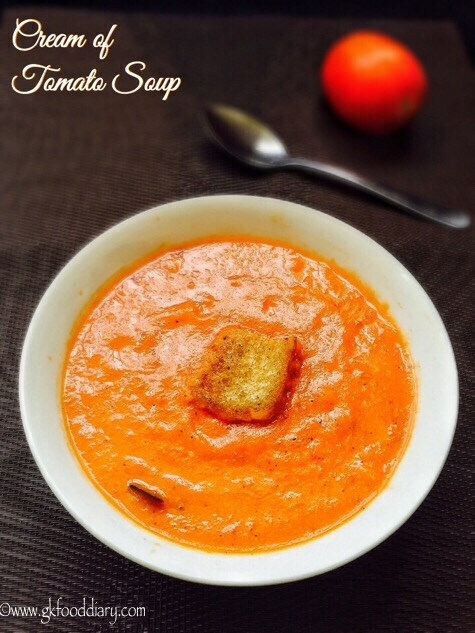 Cream of tomato soup – wholesome, creamy, healthy soup with tomatoes, butter and fresh cream. 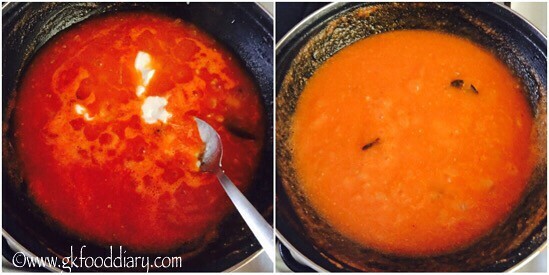 I have already posted south Indian style tomato soup (tomato rasam) so wanted to try this creamy tomato soup. It came out so well as like restaurants. 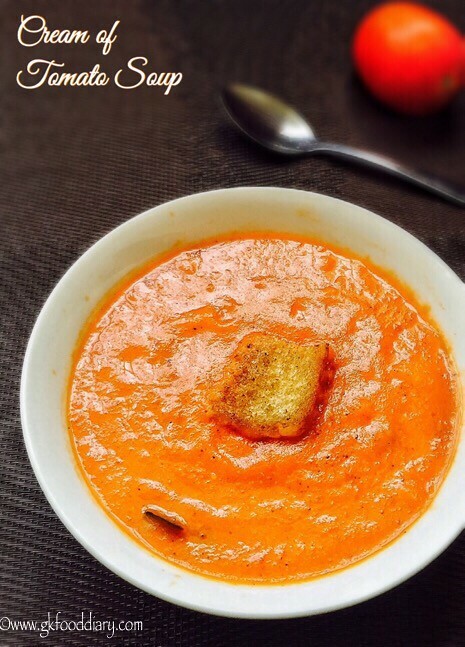 I am sure kids will like this creamy and delicious tomato soup! This creamy tomato soup is ideal for babies from 10 months and apt for monsoon or winter season. 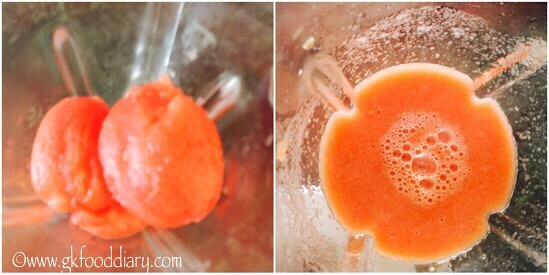 Now Let’s check how to make this easy cream of tomato soup for babies, toddlers and kids. 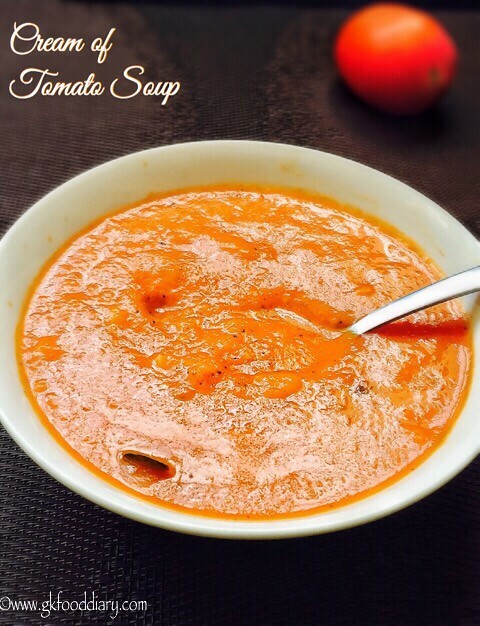 Cream of Tomato Soup - Easy and creamy soup for toddlers and kids with tomatoes. Wash tomatoes in running water well. Take a saucepan with water and add tomatoes to it. 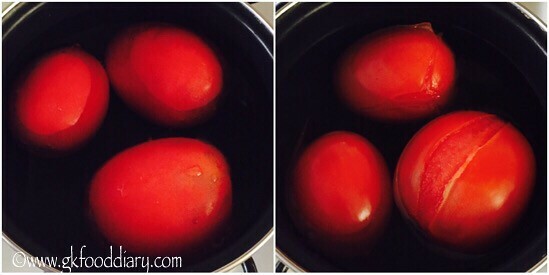 Boil them for 5 minutes or until the outer skin of tomatoes are started coming out. Switch off the flame once done and cool it down. Finely chop onions & garlic. Keep all the other ingredients ready. Grind the tomatoes to a smooth puree without any chunks. Set aside. 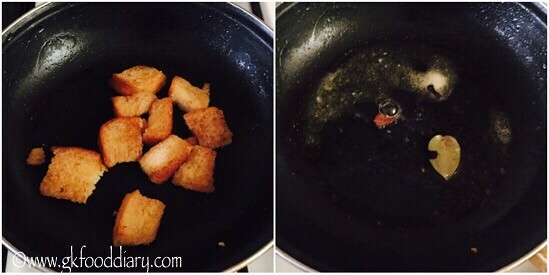 Heat a saucepan with butter and toast the bread cubes until golden brown. Remove from the pan once done.Now in the same pan, add remaining butter, bay leaves, cinnamon and cloves. Fry them for a minute. Now add chopped onions and garlic together. Fry them nicely until golden brown. Now add pureed tomatoes and mix well. Add ¼ cup of water if required. Boil it for 5 minutes in low medium flame. Once the soup is slightly thick, add required salt, pepper powder and fresh cream/grated cheese. Mix well. Switch off the flame and serve warm with toasted bread cubes. 1. Wash tomatoes in running water well. 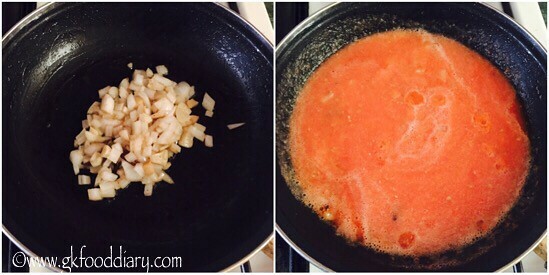 Take a saucepan with water and add tomatoes to it. Boil them for 5 minutes or until the outer skin of tomatoes are started coming out. Switch off the flame once done and cool it down. Finely chop onions & garlic. Keep all the other ingredients ready. 2. Grind the tomatoes to a smooth puree without any chunks. Set aside. 3. Heat a saucepan with butter and toast the bread cubes until golden brown. Remove from the pan once done.Now in the same pan, add remaining butter, bay leaves, cinnamon and cloves. Fry them for a minute. 4. Now add chopped onions and garlic together. Fry them nicely until golden brown. Now add pureed tomatoes and mix well. Add 1/4 cup of water if required. Boil it for 5 minutes in low medium flame. 5. Once the soup is slightly thick, add required salt, pepper powder and fresh cream/grated cheese. Mix well. Switch off the flame and serve warm with toasted bread cubes. 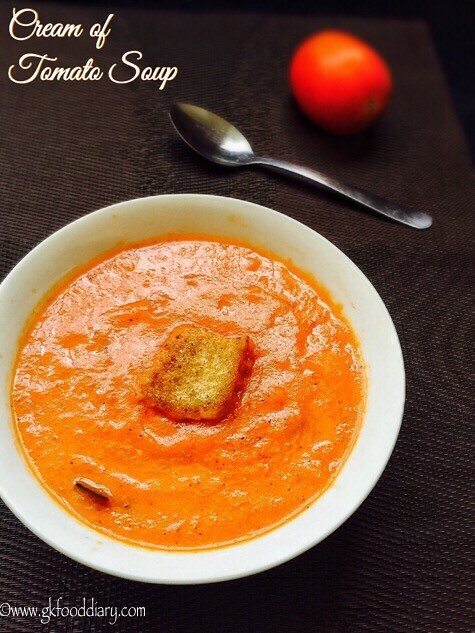 Healthy creamy tomato soup is ready to feed your kid. Serve warm! For older babies, You can add a tsp of corn flour while boiling the tomato puree, to make the soup thick and creamy. Adjust pepper powder according to the tanginess of tomatoes. You could remove the tempering items like cloves, bay leaves and cinnamon before serving to small babies. Adding bread toast is optional but recommended as it gives a nice taste to the soup. For babies above one year, You can also add 1/4 cup of milk instead of water while boiling the soup. A very delicious soup. Thank you so much for this easy healthy recipe. Frankly telling my LO didn’t taste it was skeptical to new food. But we just loved it and will prepare a bigger batch. Too tasty. Thanks. My Wife was sick. I made it for her and baby. It came out well.